The diorama is something often produced by modelers -- a small scene showing what was or what might have been. But dioramas can often be produced in full size, as well. Such was the case at the open house held by the United Railroad Historical Society of New Jersey at its restoration shop in Boonton. 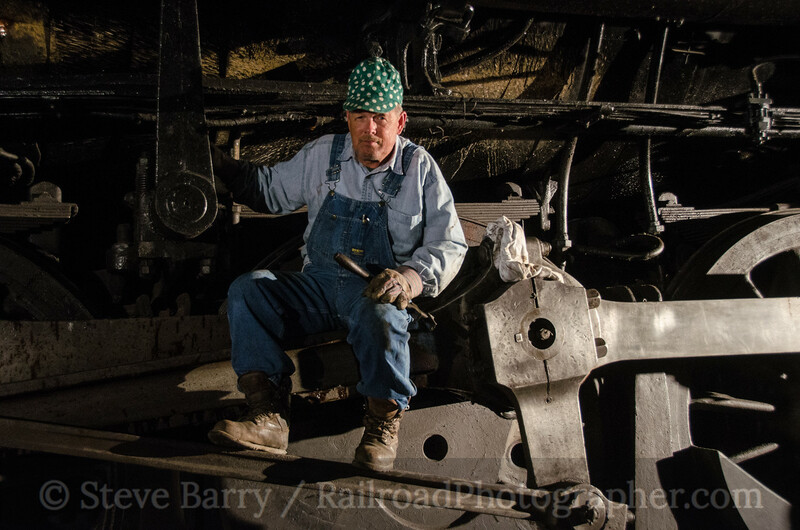 The URHS was established in the late 1980s to assist in the establishment of a state-funded railroad museum; three decades later, the state has yet to act on funding such a project. But back in the beginning, New Jersey Transit was on the brink of a complete modernization of most of its commuter lines in the northern part of the state. The agency asked the URHS which pieces of equipment were worthy of saving. The URHS identified some 60 pieces of equipment and sent the list to NJT. The transit agency gulped -- but to the amazement of everyone, donated nearly all the items on the list. 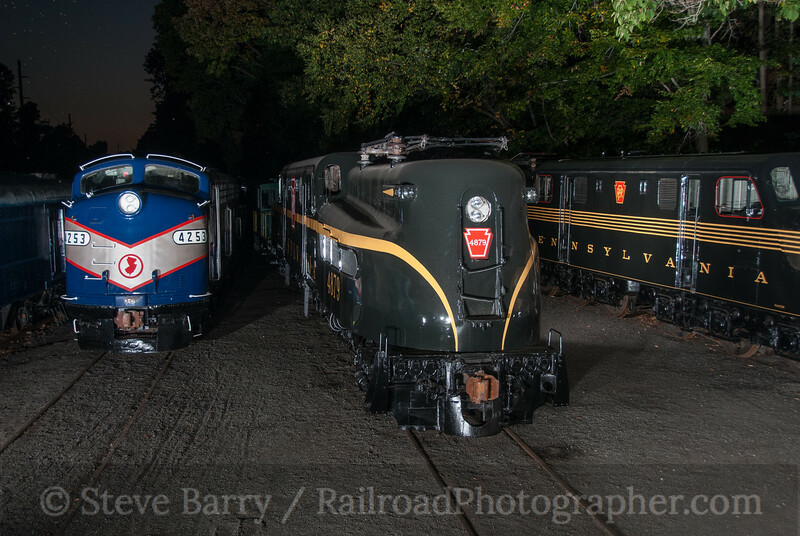 The URHS found itself in possession of a ton of equipment including three GG1 electric locomotives, several E8 passenger diesels, a fleet of passenger cars and some former multiple-unit electric cars that worked for the Delaware, Lackawanna & Western; there was a host of other equipment as well. The collection was put into temporary storage at a variety of locations around the state awaiting the funding for the state museum. A restoration yard of sorts was established at one of the sites in Lebanon, N.J. As the years dragged on, though, and no museum was forthcoming, one by one the owners of the "temporary" storage locations asked URHS to move its equipment. A permanent site needed to be found. One thing URHS was able to accomplish was getting some of the equipment restored. Various short lines and tourist railroads leased URHS equipment for favorable rates with the understanding they would restore the units. Even Metro North, the New York commuter operator, leased a pair of ex-Chicago & North Western F7s under the condition that they come back to URHS in running condition -- and painted for the Lehigh Valley! The generous rules around various federal transportation funding bills allowed more equipment to be restored. Finally, a permanent home was found for the collection when NJ Transit donated its unused rail yard in Boonton. The equipment that hadn't been leased out was gathered and moved to the new site. A restoration shop, cleverly built out of storage containers, was constructed. Money from donations and grants was still coming in, and equipment began to enter the shop and come out at least cosmetically restored. A few luxury passenger cars had been put back into service, fully certified to run on Amtrak, to generate additional revenue. The crown jewel of the fleet is the Hickory Creek, an observation car that ran on the New York Central's 20th Century Limited. All this brings us back to dioramas. The facility at Boonton is a restoration yard, not a museum site. Nonetheless, each year the URHS holds an open house at the facility. The space is limited, but for photographers there are a couple of "dioramas" set up. The effect is especially effective after dark when night photography comes into play. For the open house, one end of the shop complex held a New York Central scene. 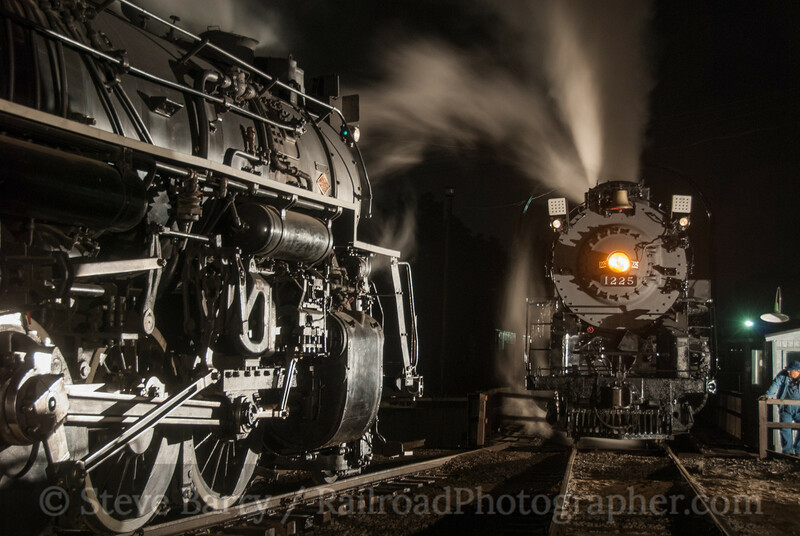 The Hickory Creek was posed next to E8 passenger diesel No. 4083. No. 4083 wears a love-it-or-hate-it experimental scheme of jade green the NYC tested in the 1960s -- No. 4083 was one of six units to receive the scheme, and is the only survivor. 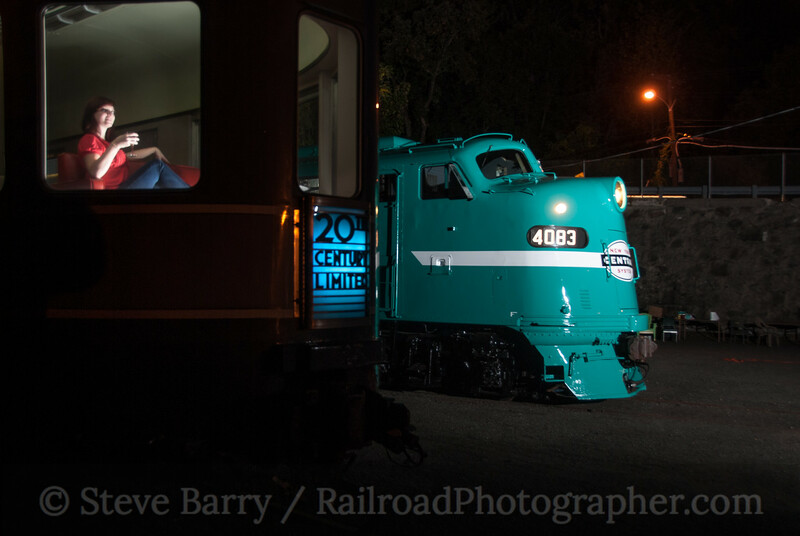 Perhaps this scene could represent the eastbound and westbound 20th Century Limiteds meeting somewhere in the dark, or perhaps the engine change at the Harmon Shops in Croton, N.Y., where electric locomotives that led the train out of Grand Central Terminal were swapped for diesels for the rest of the run to Chicago. The other end of the shop featured units that operated for New Jersey Transit on its New York & Long Branch service from Hoboken and New York City to Bay Head, serving the northern towns of the Jersey shore. In the early 1980s NJT trains left Pennsylvania Station in Manhattan behind GG1 electric locomotives that had served the Pennsylvania Railroad since the 1930s and 1940s. At South Amboy the massive motors were swapped out for E8 passenger diesels, classics in their own right, to continue on to Bay Head. This scene was a slight mismatch of eras, however. By the time NJT got ahold of GG1s for service, they had lost their attractive Brunswick green paint and gold striping, replaced by solid black from when they worked for Penn Central. 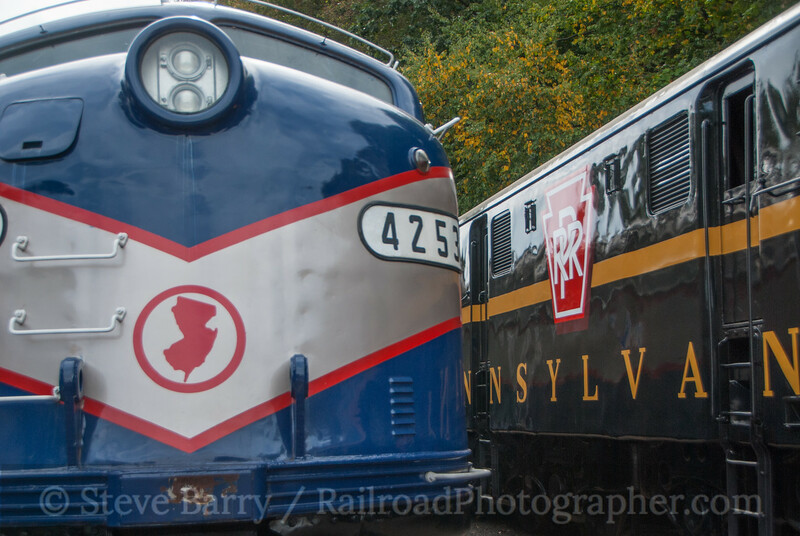 Thus, in real life the good-looking blue and silver NJT diesels would not have ever appeared with Pennsy-painted GG1s. 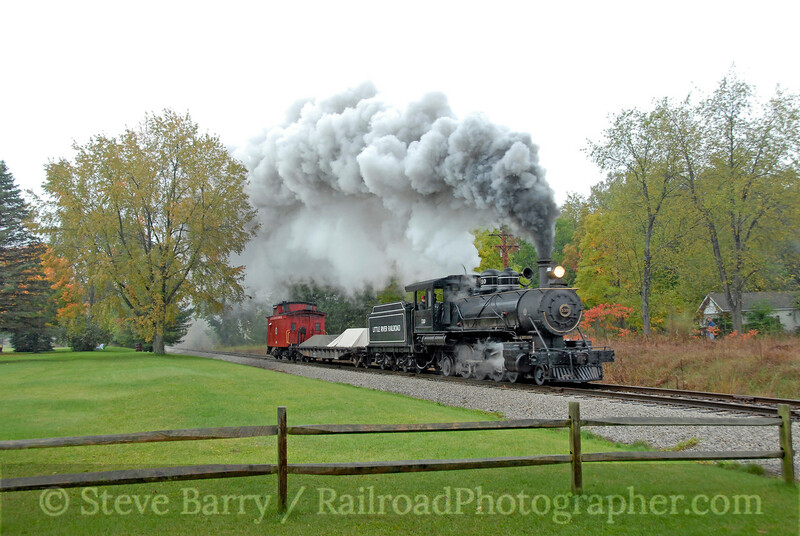 Nonetheless, the locomotives did work together at South Amboy at one time. 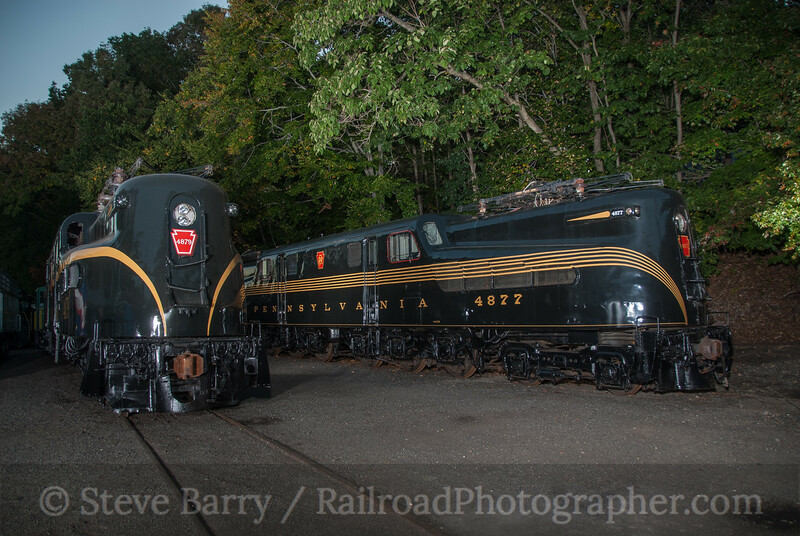 The URHS has done a remarkable job in the cosmetic restoration of these two GG1s. No. 4877 has received the five-stripe whiskers scheme, while No. 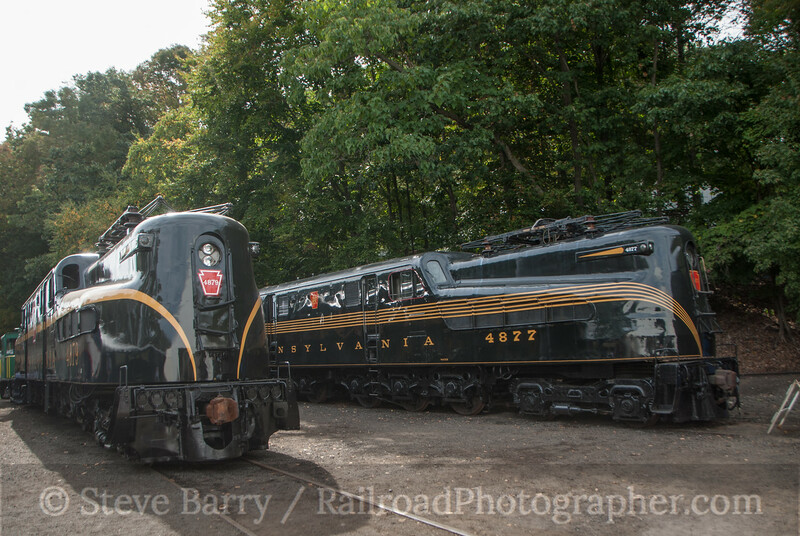 4879 has the single large stripe with a larger Pennsy keystone on the side. Both look really good. So there you have some full-size modeling. Perhaps someday the state will finally establish the transportation museum and the equipment will be more readily available to the public. In the meantime, watch for the URHS open house each September. For more information check out the URHS website. 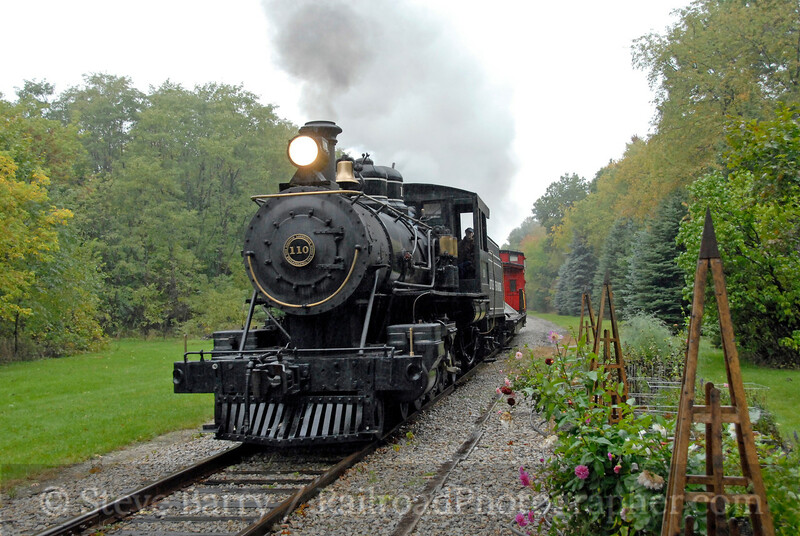 For more daytime photos of the equipment at Boonton you can click here. 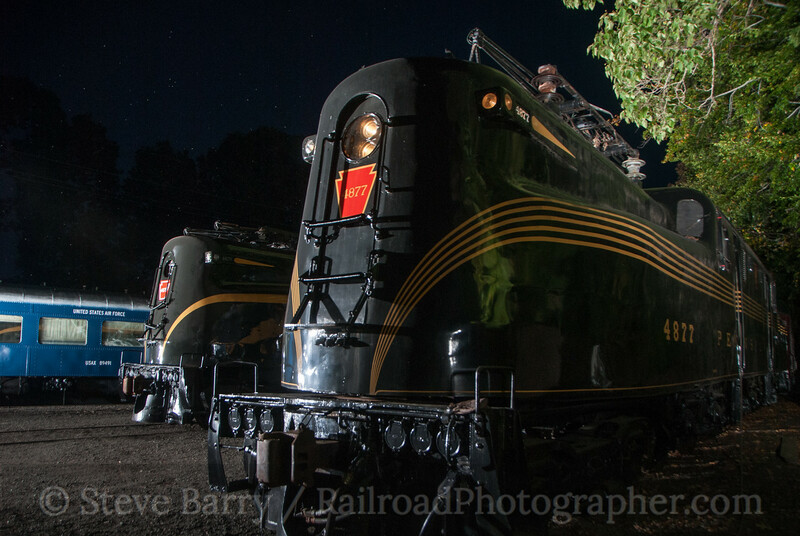 For more night photos from Boonton you can click here and scroll to the second page. 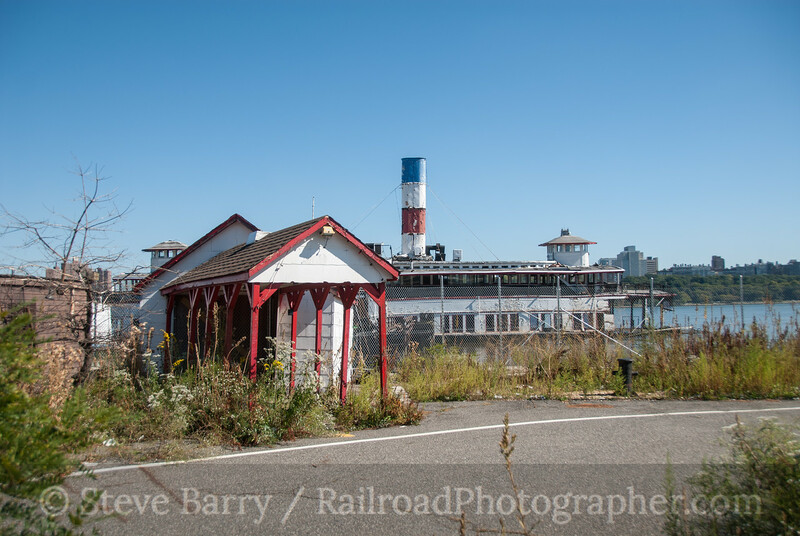 A significant piece of railroad history sits partially submerged in the Hudson River in Edgewater, N.J. 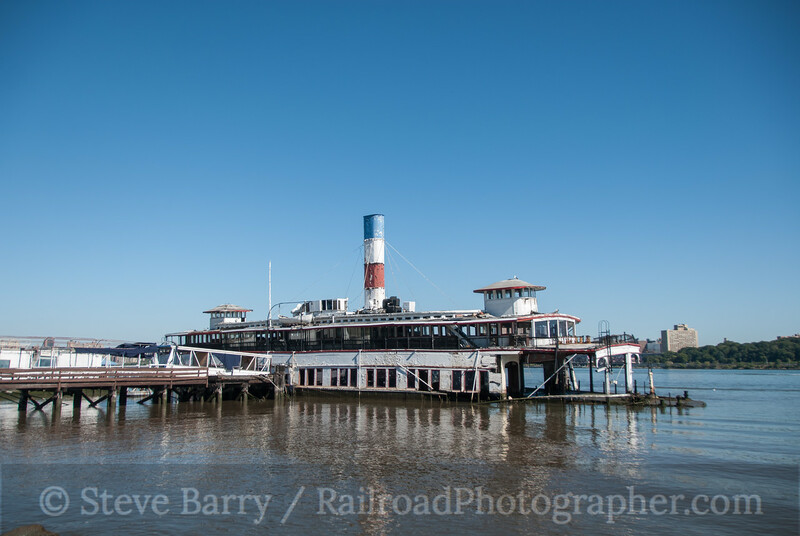 The ferry boat Binghamton once served the Delaware, Lackawanna & Western Railroad, taking passengers from the Lackawanna's trains across the Hudson between Hoboken and Manhattan. The Binghamton was built in 1904-'05 by Newport News Shipbuilding & Dry-dock Company, was launched on February 20, 1905, and entered service on April 3, 1905, for the Lackawanna's Hoboken Ferry Company. 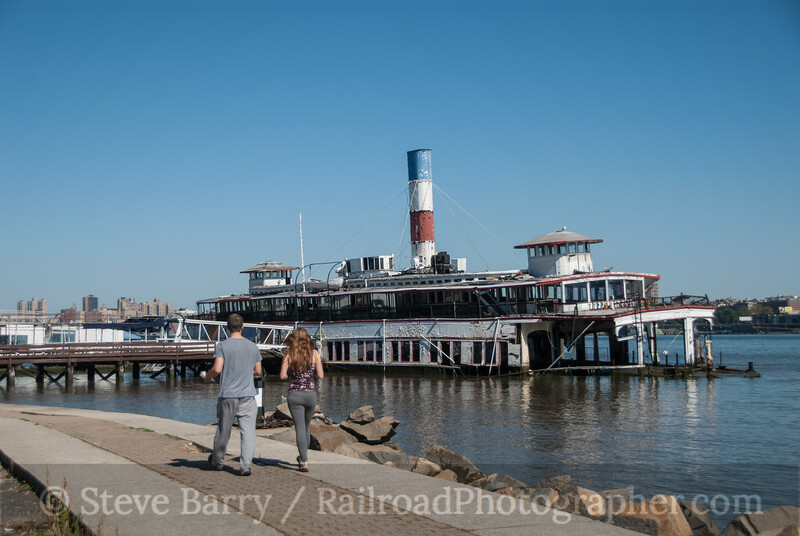 It was one of six identical ferry boats operated by the Lackawanna. Almost immediately the need for ferry service began to decline. The Pennsylvania Railroad and the Hudson & Manhattan (now PATH) both tunneled under the Hudson in 1907. The Holland Tunnel opened in 1927, with the Lincoln Tunnel following a decade later. The last ferry crossing by the Lackawanna was made on November 22, 1967; by then the Lackawanna had merged with the Erie Railroad to form the Erie-Lackawanna. 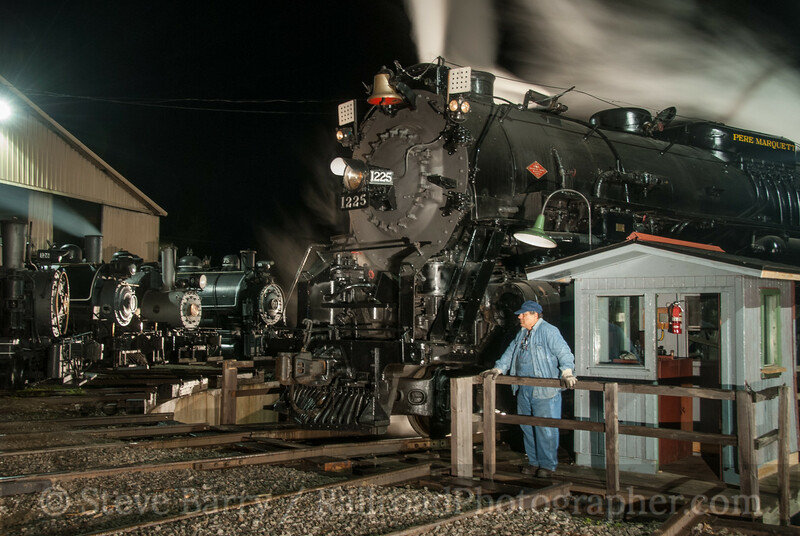 In 1969 the Binghamton was purchased by a contractor with the dream of converting it into a restaurant. In 1971 it was moved to Edgewater. The initial plans never materialized, but a new owner came on the scene in 1974 and the Binghamton was moved about a half mile to its current location in 1975. Later that year the restaurant finally opened. It was added to the National Register of Historic Places in 1982. The restaurant was shuttered in 2007 and the intervening years have not been kind to the Binghamton. 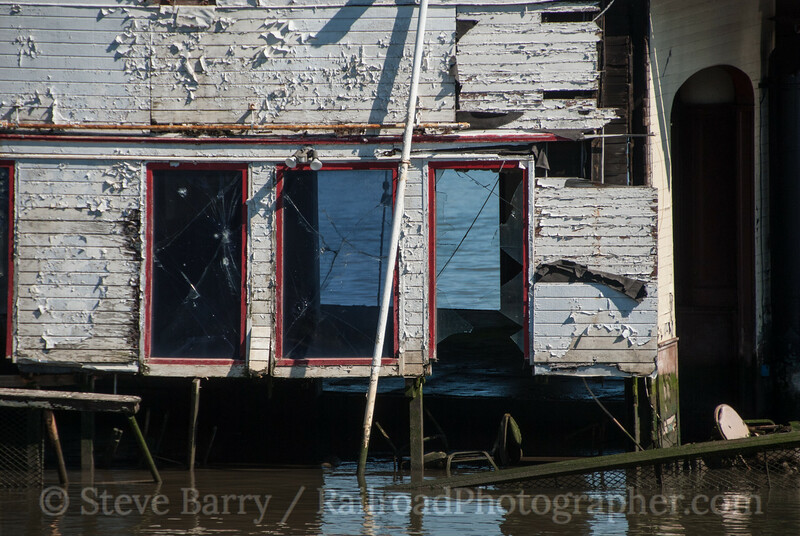 Its owner applied for a demolition permit in 2011, but before any work could be done the boat took on water and became partially submerged it in 2012. Hurricane Sandy did major damage later in 2012 (the river side of the boat looks much worse than the land side seen in these photos) and a suspicious fire did further damage in May 2013. For now the Binghamton holds the distinction of being the last double-ended steam-powered ferry left on the Hudson, but that won't last much longer. The current owner is in the process of paying fines he owes to Edgewater for various code violations and will hire a contractor to demolish the boat. A barge restaurant will ultimately occupy the Binghamton's berth. 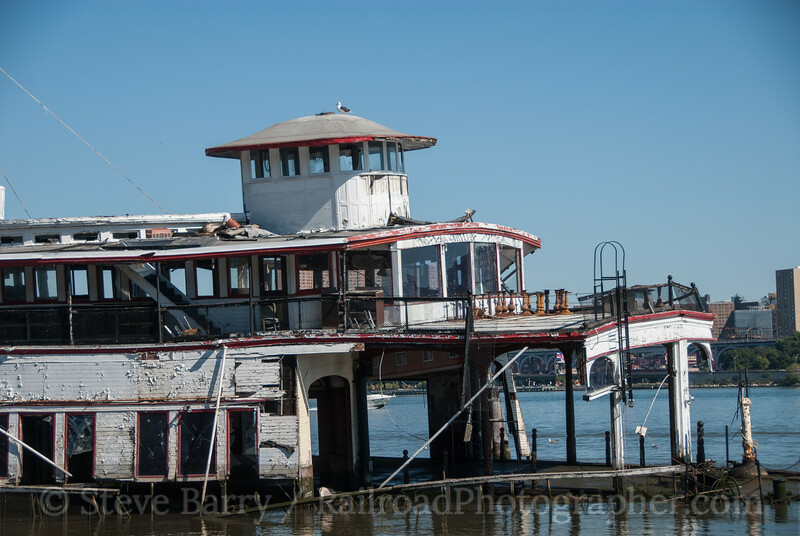 For now, though, the Binghamton remains in sad condition, it's wheelhouse sign that once proudly proclaimed its name resting on the ferry's roof. 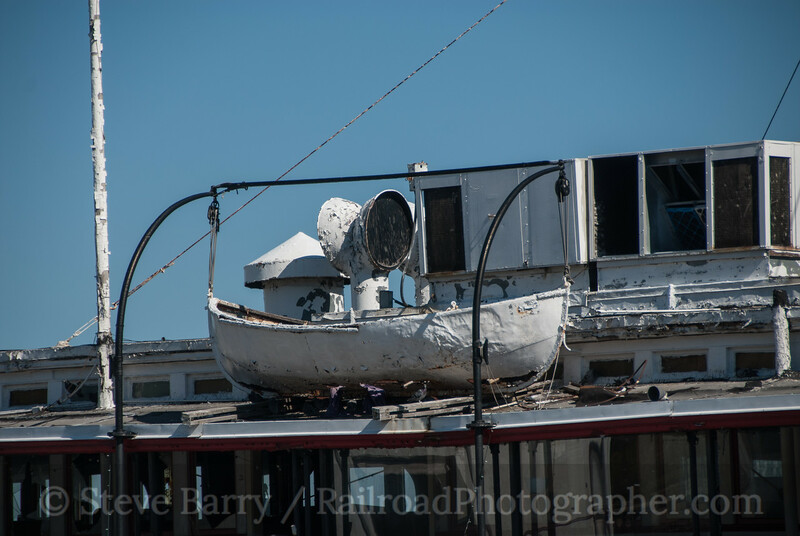 The boat was on borrowed time when these photos were taken on September 27, 2014. It's unclear just how much longer the Binghamton has left, but time is not on its side. More photos can be found here. 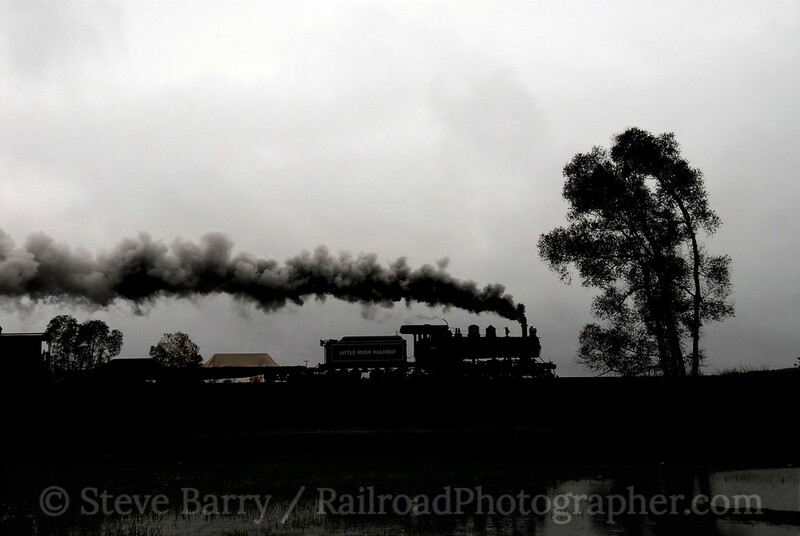 Just over five years ago I attended the most rainy photo charter I had ever been on. 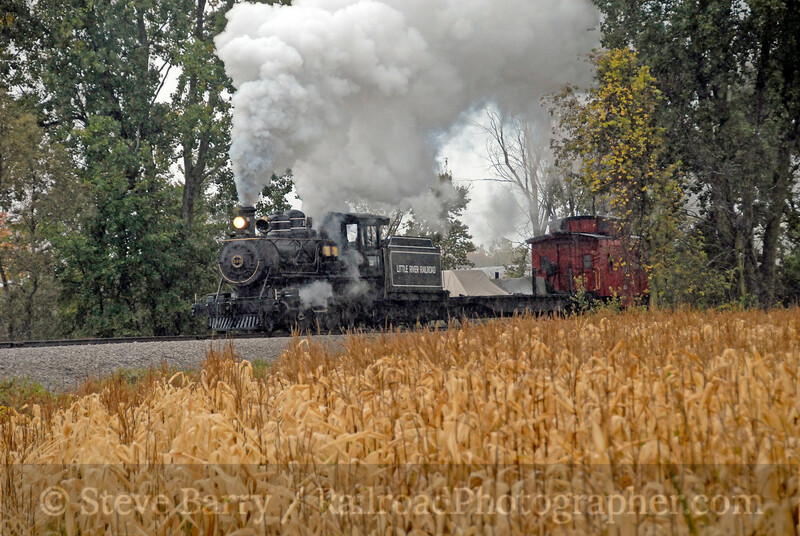 Historic Transport Preservation was in Michigan for two days of charters with Nickel Plate Road No. 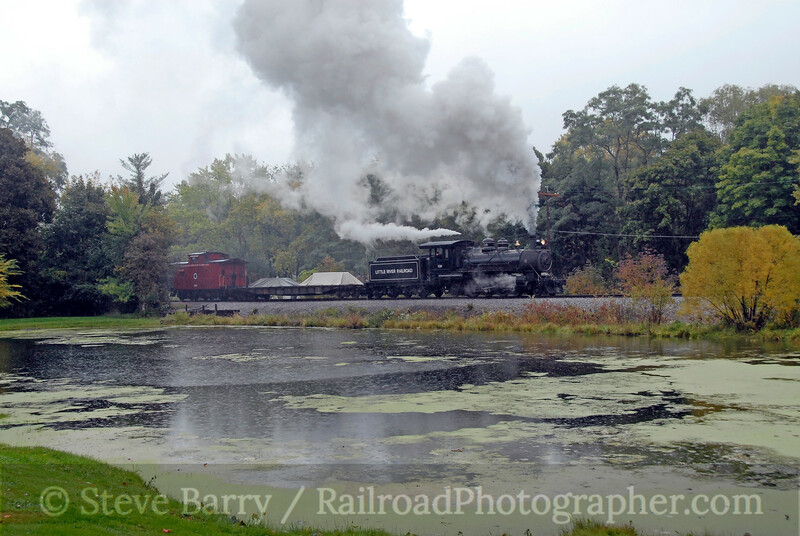 765 out of Owosso, but as a bonus trip HTP added a day on the Little River Railroad using 4-6-2 No. 110 -- the smallest standard gauge Pacific ever constructed for use in the United States. The day started off wet and dark. 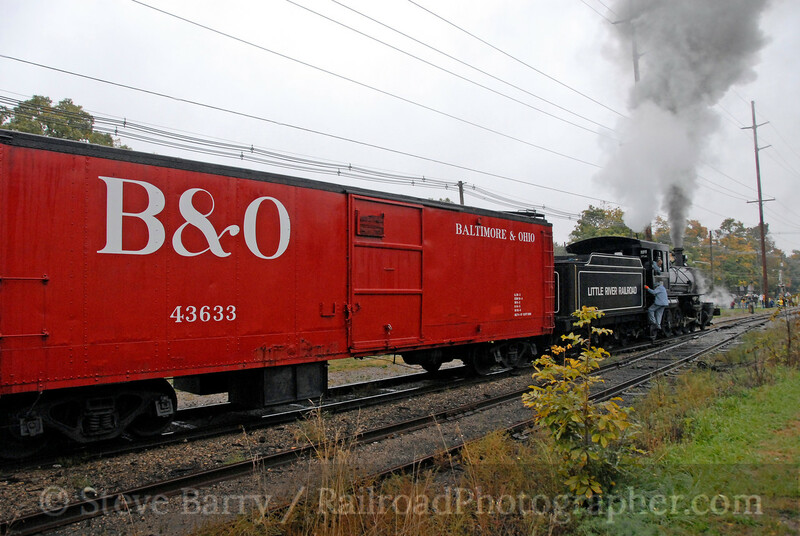 A couple of runbys were done in Hillsdale with a Baltimore & Ohio boxcar behind No. 110. Unfortunately, the boxcar was limited to yard service, and the photo train headed out of town with a flatcar and caboose trailing. The photographers for this trip went to predetermined photo locations by car. 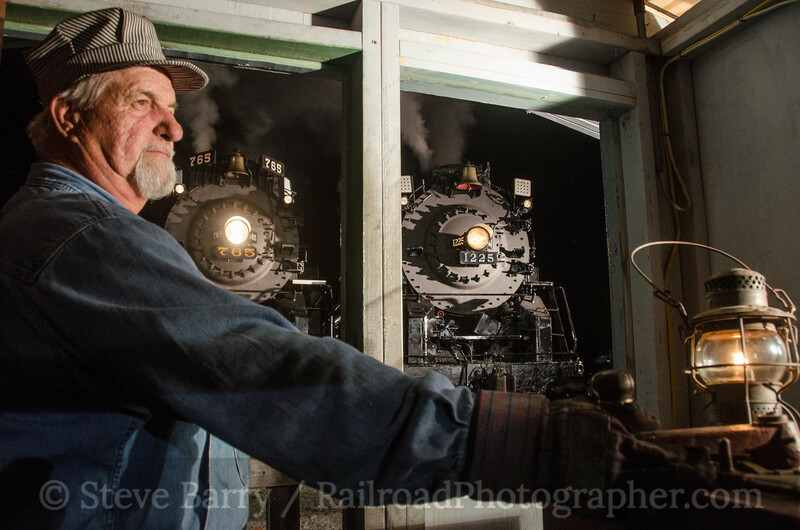 John Craft was the coordinator for Historic Transport Preservation, and one of the photo locations was at the station in Jonesville. John's wife, Danah, waved to the train while staying out of the rain under the station eaves. After a set of runbys at Hillsdale (top photo of this post), a nice open field at Bankers provided some nice angles. The rain was still coming down. At the mill in Reading it was decided to get some "human interest" into the shot. 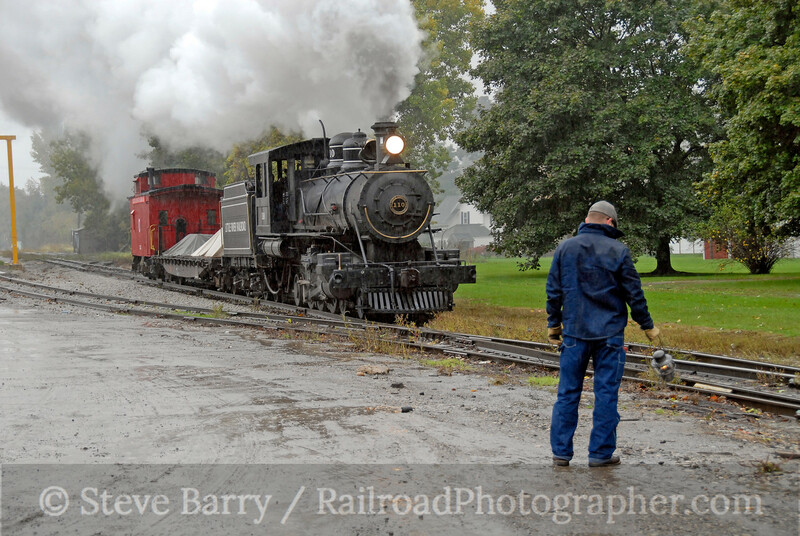 A very wet brakeman was sent into the downpour with a lantern to pose for shots. 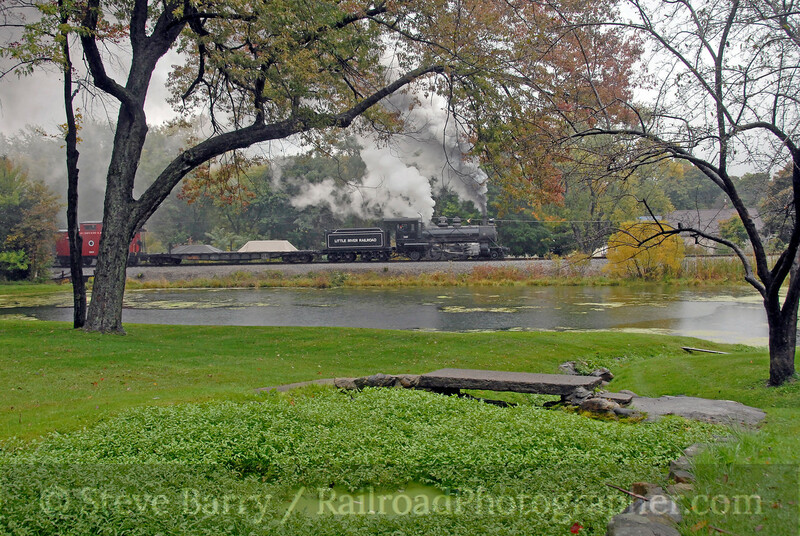 Look carefully at the caboose and you can see the amount of rain coming down. At Montgomery a shot was done looking down a dirt road. Well, a mud road. The chasing automobiles were starting to accumulate a lot of tracked-in mud and wet interiors from soggy photographers getting back in after each photo location. 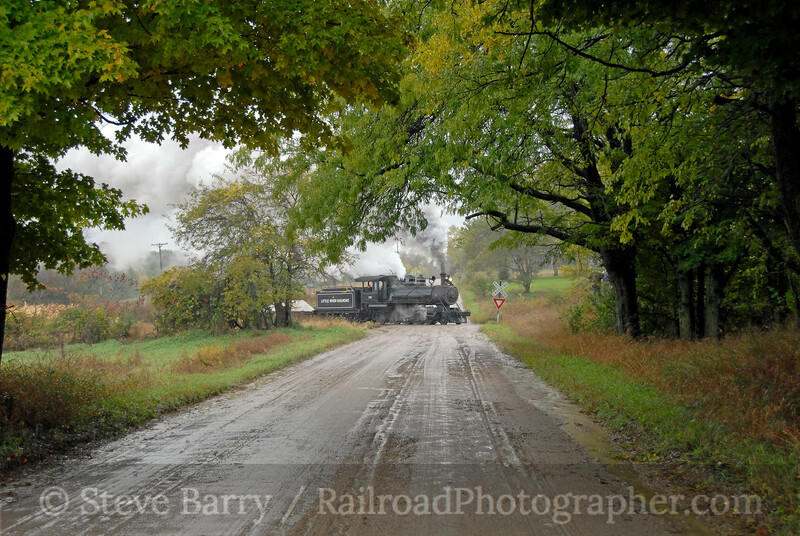 From Montgomery the train returned to Hillsdale for one more set of runbys before calling it a (wet) day. The next morning at the first runby with No. 765, as the sun was rising my very soaked lens suddenly fogged up. Friend Bill Raia also had his lens fog up at the exact same moment -- come to find out, we were both using Nikon 18-200 zoom lenses, and for some reason that certain dew point triggered a huge amount of fogging. I went back to the car and held my lens up to the air conditioner, trying to force dry air into it. It was quite an exclamation point to the previous day. We'll finish with one more rainy shot at Hillsdale. More photos from this charter can be found here. 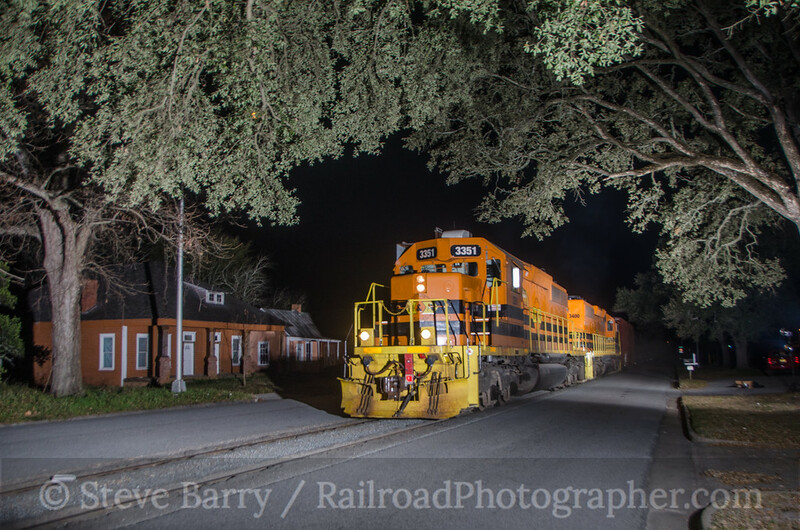 The short line railroads of the south have their own charm. They have a reputation of being laid back and friendly, and many have a storied history. Some are prosperous, some just hang on. One prosperous short line that has (or at least had) the appearance of "just hanging on" is the Aberdeen, Carolina & Western. 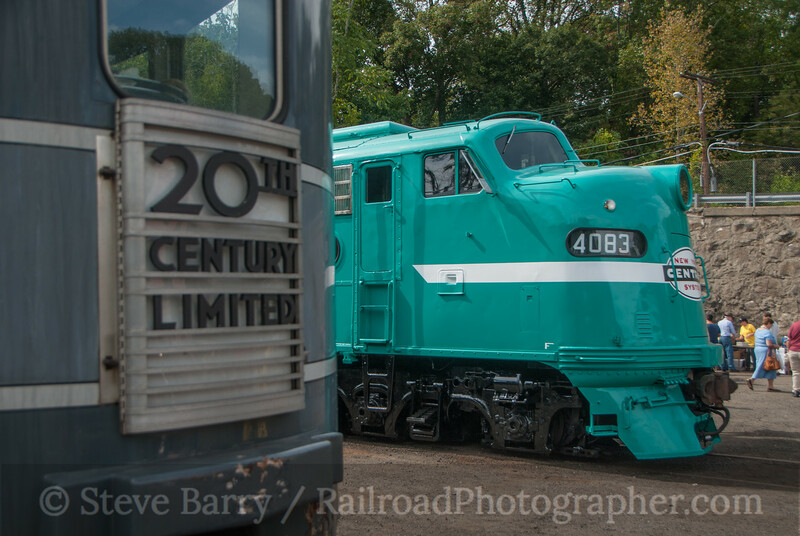 Today's AC&W has sharply painted locomotives operating over 150 miles east of Charlotte. But when I first visited the railroad in 1992 it was only five years old and scratching out a living between the towns of Aberdeen and Star. The line's shop was in Star, and on my first visit it showed a lot of hardscrabble southern charm. 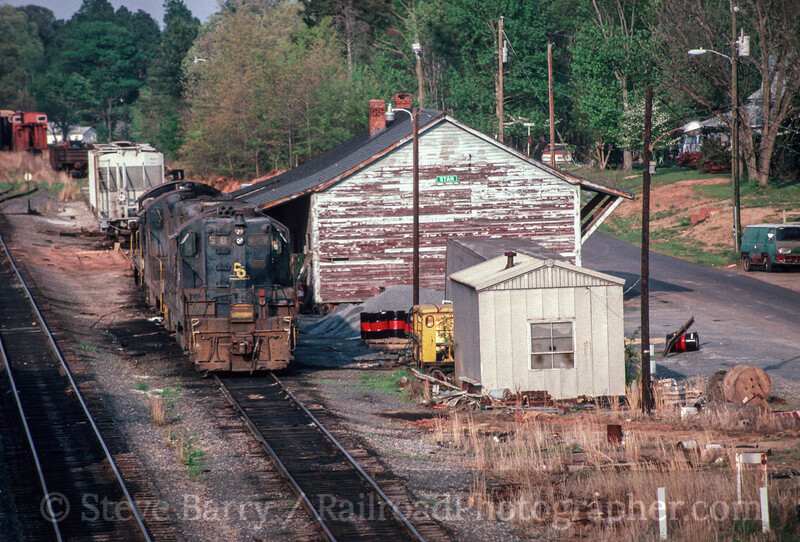 The freight house showed its Southern Railway heritage thanks to the distinctive green sign on the building, and a former Chesapeake & Ohio EMD GP9 sat outside. Definitely a hand-me-down railroad. My next visit to Star was five years later on May 6, 1997. This time I was there at night and wanted to do some night photos. The shop was wide open on the warm spring night, the lights were on, but no one was around. Not finding anyone, I took a few night shots and left. 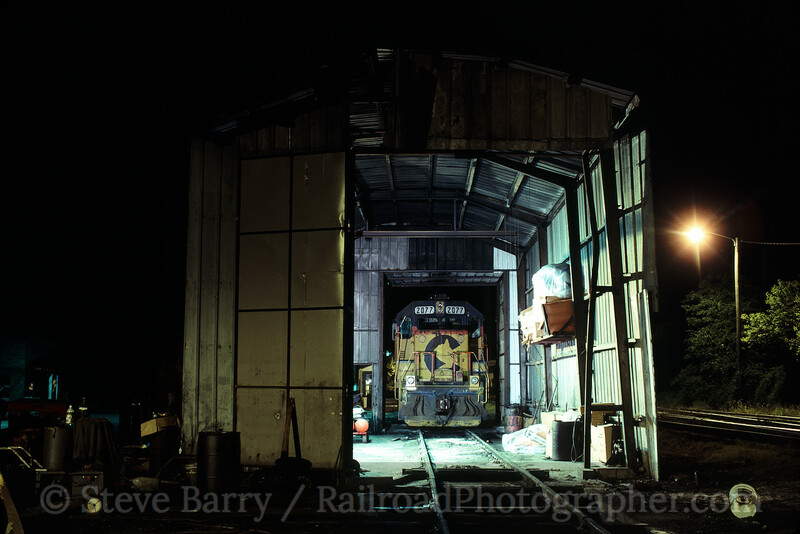 Once again the hand-me-down life of the railroad was evident by the locomotive in the shop -- ex-Chessie System GP38 No. 2077. It looks like this year I'll be making a couple of trips southward during the winter, and the short lines of North Carolina are high on the list of places to visit. The Aberdeen, Carolina & Western will certainly be one of those. 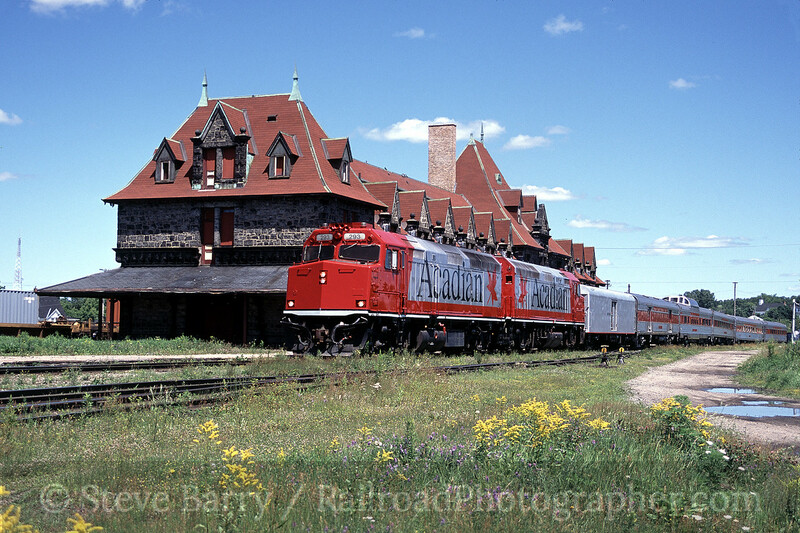 In July 2002 I went to the Maritime provinces of Canada, along with my brother Bruce, to photograph the three VIA Rail Canada streamliners running at the time. We spent one day chasing the Chaleur onto the Gaspe peninsula, two days chasing the Ocean to Halifax and one day chasing the Bras D'Or onto Cape Breton to Sydney. The Chaleur is currently suspended (I guess it's running with buses due to bad track), the Ocean no longer has its streamlined equipment and the Bras D'Or is long gone. It proved to be a worthwhile trip given all the change that has come to the Maritimes. On our way home from Cape Breton, we were traveling west on a day that a short-lived luxury cruise train was heading the same direction. The Acadian made a once-a-week round trip from St. John, New Brunswick, to Montreal, Quebec, with an overnight stop at Greenville, Maine. 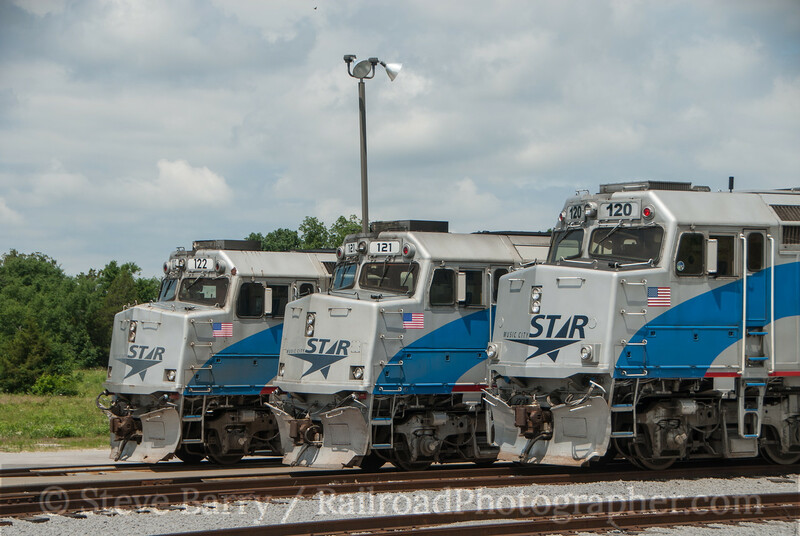 Powering the train were three former Amtrak F40PH locomotives, two of which were used at a time. 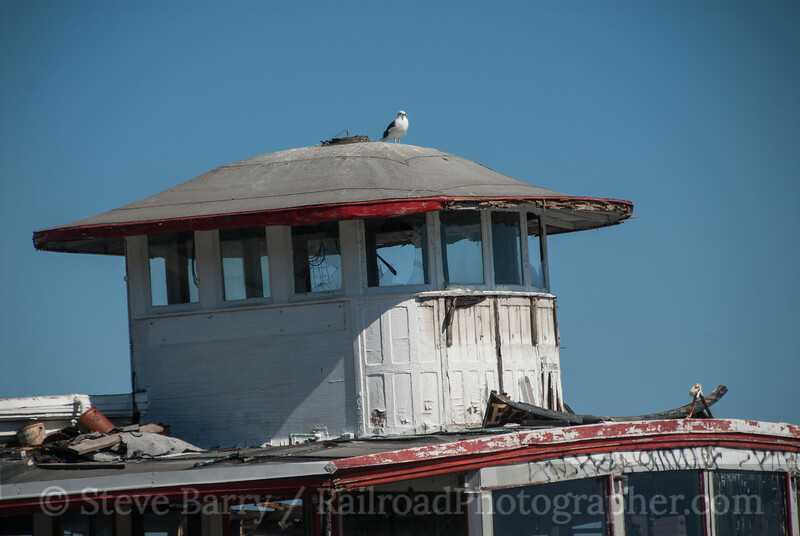 We set up in St. John at the Reversing Falls bridge, shot the train there, then headed west, shooting the train once again at Fredericton Junction. From there we bee-lined to the one shot we really wanted to get -- passing the magnificent former Canadian Pacific station at McAdam, New Brunswick, just east of the U.S. border. When we got there, the shot was looking like it wouldn't be quite like we had planned. The tracks were lined for a train to travel on the north side of the station, and the building would cover most of the train. Weeds were in abundance as well. For some reason we couldn't see down the tracks far at all -- the train was going to just pop out from behind the station with little warning. And to complicate matters, the sun started playing peek-a-boo with the clouds. We waited and as our estimated train time approached we heard a rumble. Unfortunately, a cloud parked itself between us and the sun. Oh, well... The rumble got louder, we aimed our cameras -- and a freight for New Brunswick Southern (which operates freight service on the tracks) popped out from behind the station. Hmmm... The train pulled ahead then tied down west of us, which was a very good thing -- it would force the Acadian to take the much better track on the south side of the station. In due time, the Acadian appeared and this time the sun was out! The resulting photo can be seen at the top of this post. 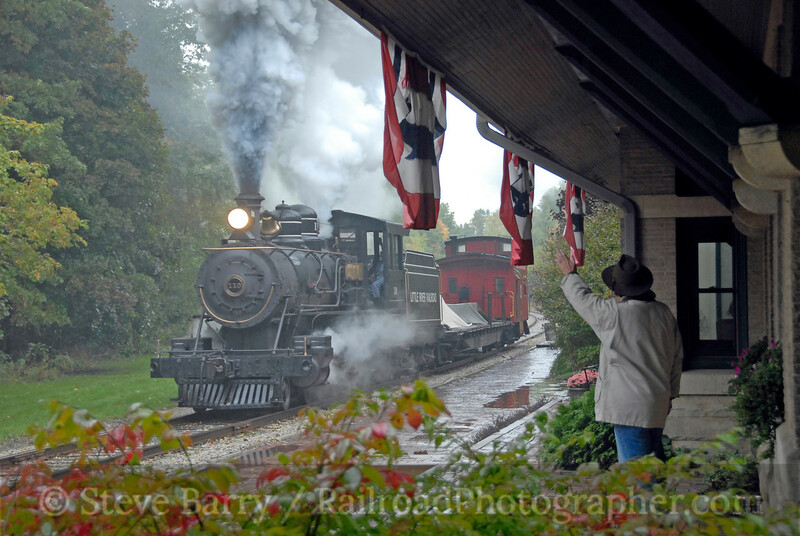 Once into Maine, the train would no longer be chaseable, so we let it go here and returned to the U.S. at a leisurely pace. The Acadian had begun service in June 2002, so it had been running only about a month when we photographed it. It stopped running in June 2003, just few days after its one-year anniversary. 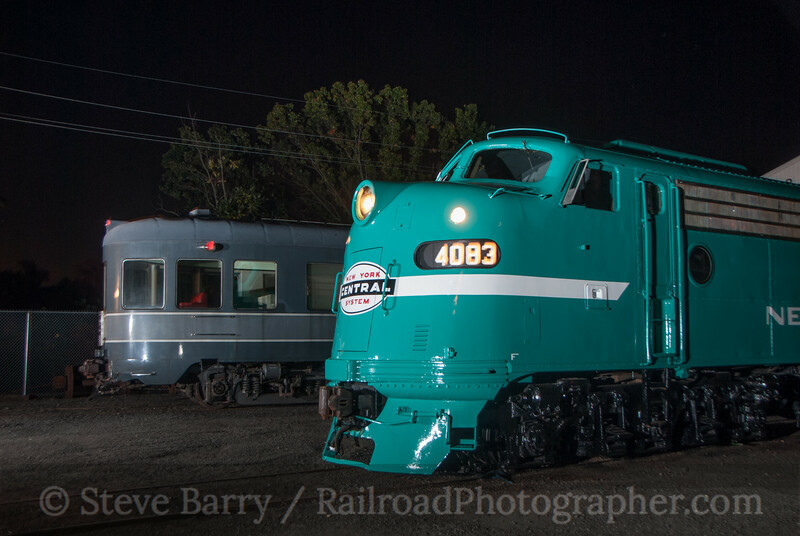 It proved to be a fitting coda to a trip to shoot the vanishing streamliners of the Maritimes. 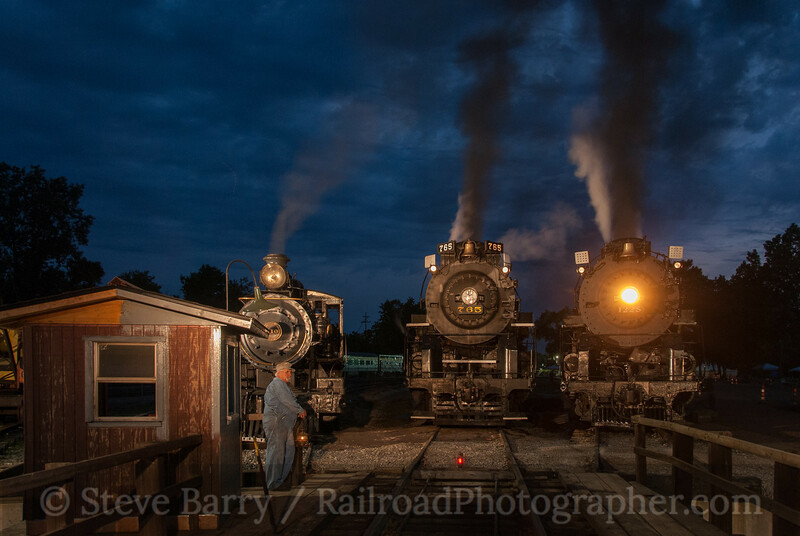 We're moving along with the big circle trip across the midwest from New Jersey to Arkansas and return. In both directions my brother Bruce and I stopped in Music City USA -- Nashville, Tenn. -- to check out the rail action. 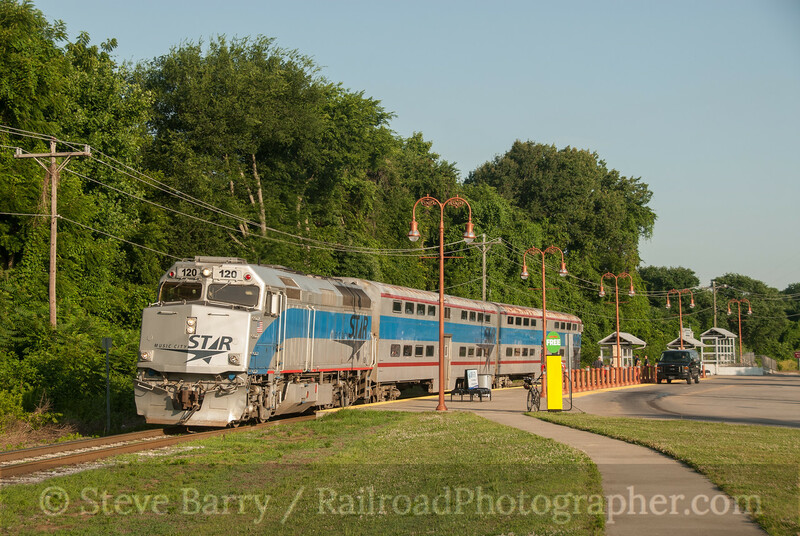 Our first stop on the outbound trip was at Lebanon, Tenn., where the Music City Star commuter trains lay up. Since this was a Sunday (June 8, to be precise), no Star trains were running. Moving into Nashville our next stop was at the yard of the Nashville & Eastern just east of downtown. 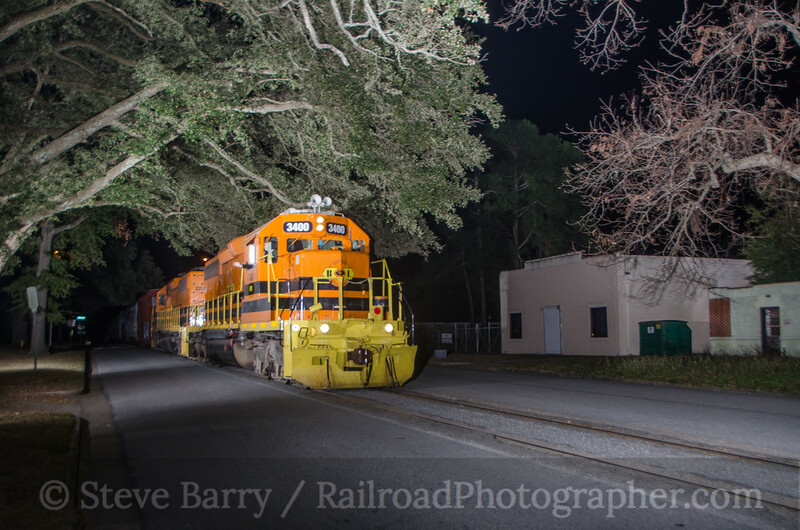 The railroad had some interesting locomotives in the yard, including a couple in modified BNSF Heritage II paint, relettered for the N&E. B40-8W No. 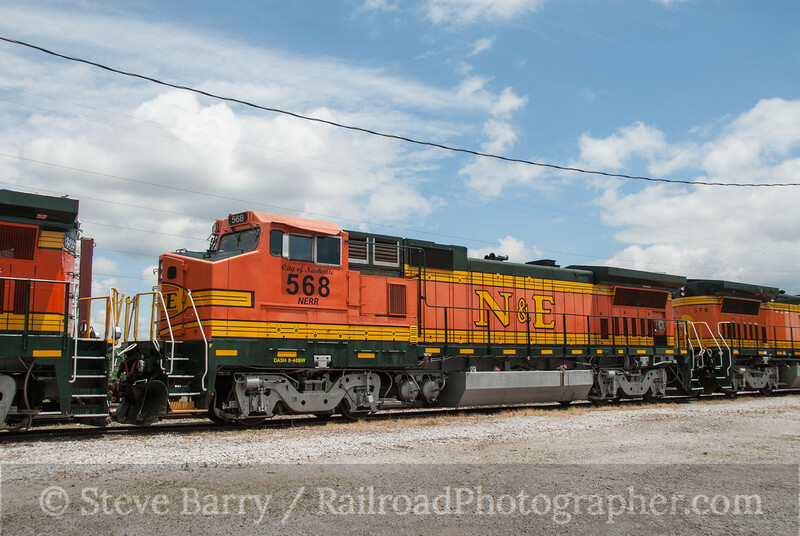 568 showed off the modified scheme, with N&E lettering replacing the BNSF on the nose and flank; it has also been named City of Nashville. Next we went into downtown, where the event formerly known as Fan Fair was going on (back before Nashville sold its soul to Clear Channel -- but I digress). 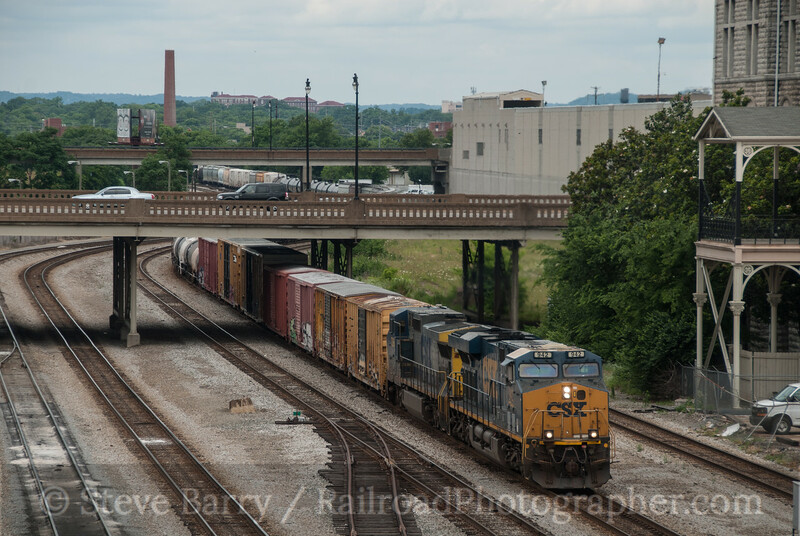 Demonbraun Street provides a nice overview of southbound CSX trains passing under Broadway (below) and going by Nashville Union Station (top photo of this post). The station used to have a large train shed extending south from the headhouse, but all that's left is an empty parking lot. A steady stream of trains paused here to change crews. From here we continued west to Arkansas, but we would pass through Nashville again on the return trip, this time on Thursday, June 19. 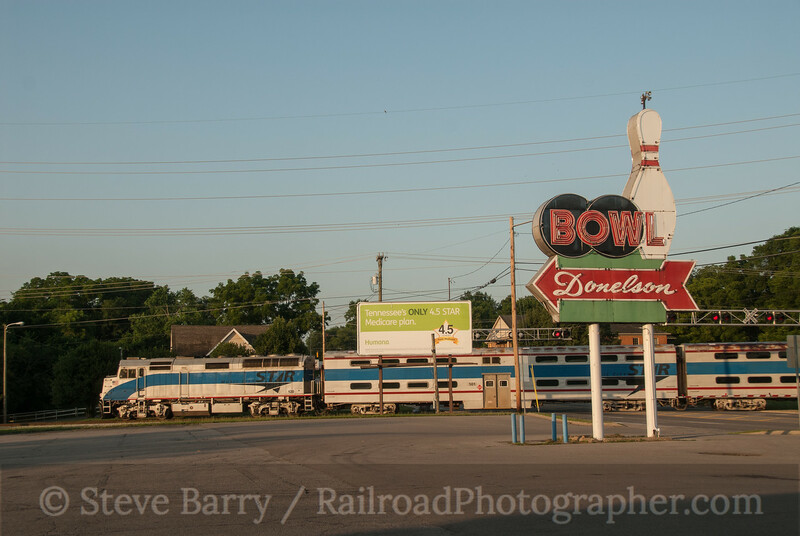 Our first stop was to get an inbound Music City Star train passing the bowling alley at Donelson as it pushed into Nashville. Next we had an outbound train passing through the station in Donelson. It would meet another inbound train just east of the station. 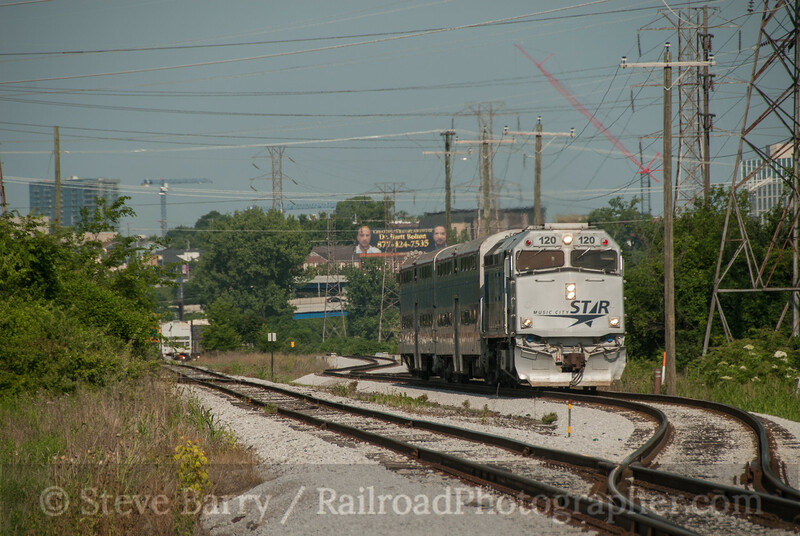 Music City Star began operating on November 6, 2006, with the hope of capturing 1500 riders each day. Those numbers have never come to fruition, with 2013 ridership running around 900 passengers (which is actually slightly less than the previous year). Part of the problem is the Star only has three inbound trains in the morning and three outbound trains in the evening, with no midday service; to a large extent, many jobs are moving away from traditional work hours, making the train impractical. The other issue is the Nashville station is located outside the core of downtown, forcing riders to finish their trip to work on a bus. Nonetheless, Nashville remains committed to making the service work. Service is maintained with three EMD F40PH locomotives that originally worked for Amtrak. Numbered 120-122 (Amtrak 332, 398 and 399 respectively), they pull two or three ex-Chicago & North Western gallery cars. Surprisingly, the trains don't lay over in Nashville during the day. 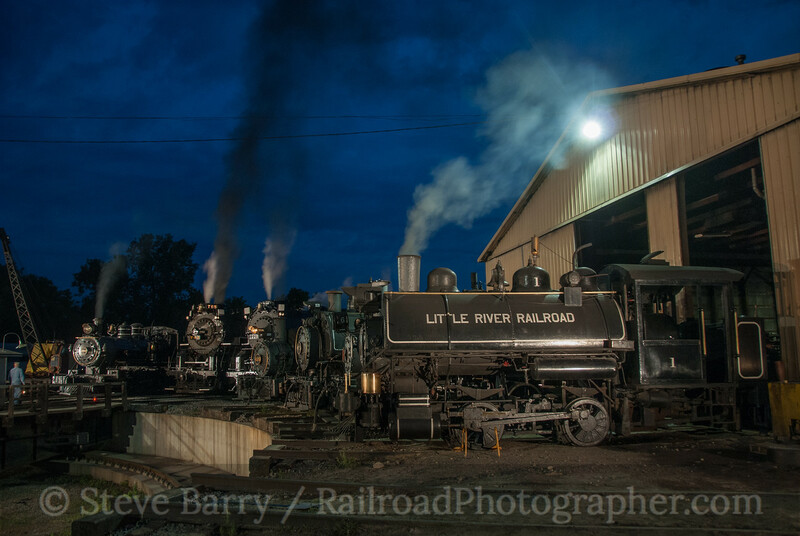 All three sets return to Lebanon as revenue moves (although ridership is extremely light). They then return to Nashville (once again as lightly-used revenue moves) for the evening rush hour. 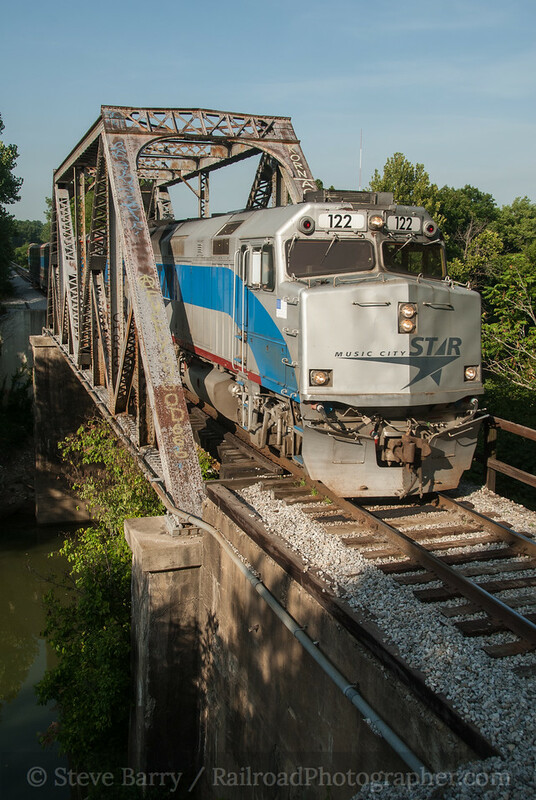 After finishing at Donelson we moved to the scenic highlight of the line -- the through truss bridge over Mill Creek outside Nashville, where we caught an outbound almost-deadhead move behind No. 122. 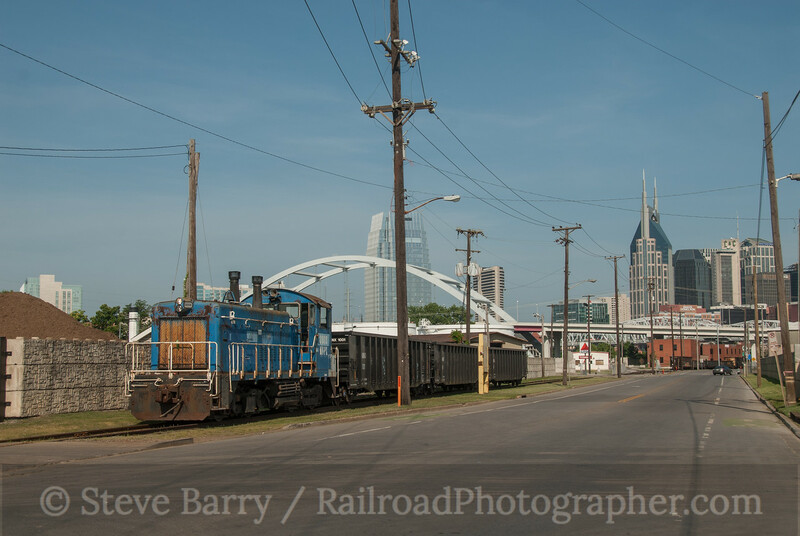 We wrapped up our look at Nashville when we found a Motive Power Resources leased switcher working what appeared to be gondolas of scrap metal outside of downtown. 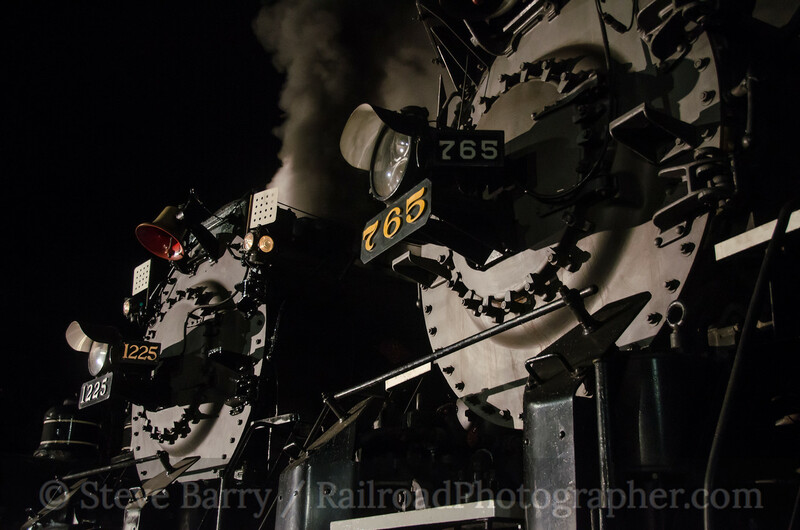 We were unable to determine the company the locomotive was working for, however. From here, we headed north -- I had to drop Bruce off at Lafayette, Ind., to catch Amtrak's Cardinal home, while I continued on to Owosso, Mich., for Train Expo. 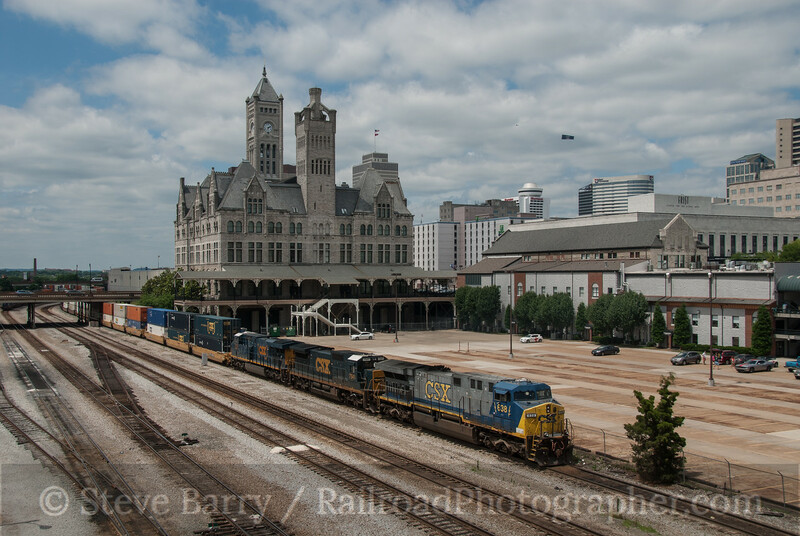 More photos from the first day around Nashville (including the Union Station area) can be found here. Photos from the second day (including more Music City Star) can be found here. 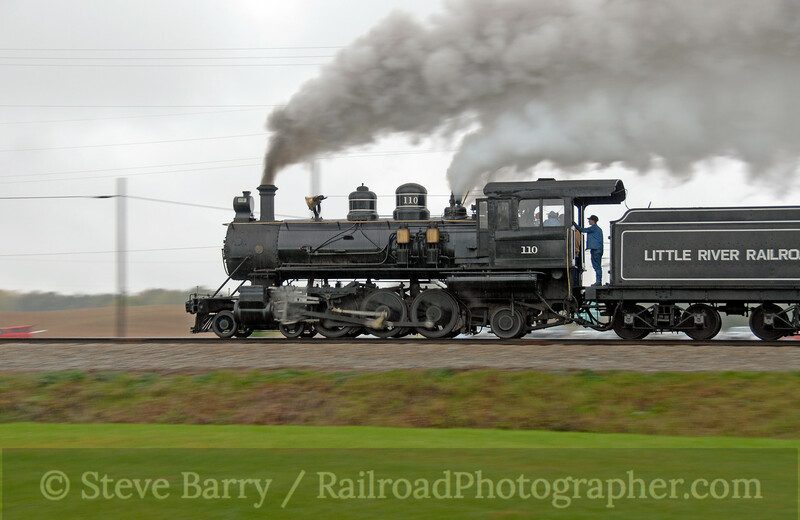 We're continuing our two-week foray into the upper midwest, turning back east from the National Railway Historical Society convention in Springdale, Ark. 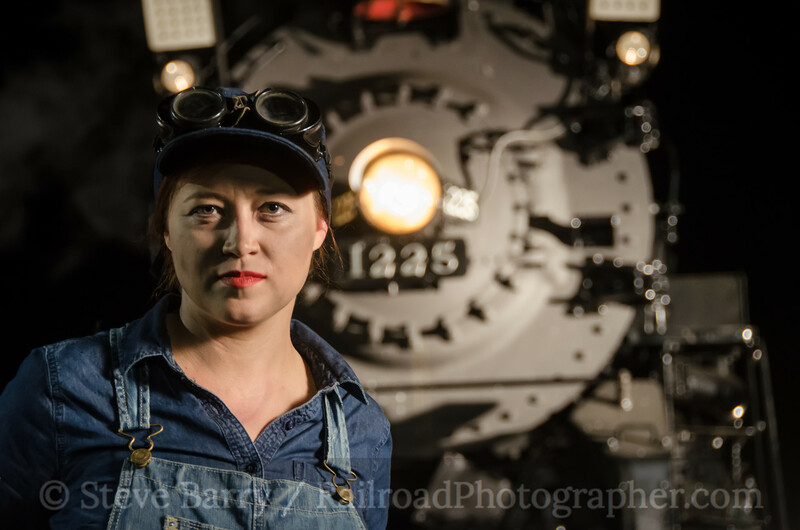 So far we have ridden a photo freight charter on the Arkansas & Missouri, visited tourist railroads in the Ozarks, chased the Amtrak display train behind A&M Alco diesels, and headed south along the Kansas City Southern in three states. 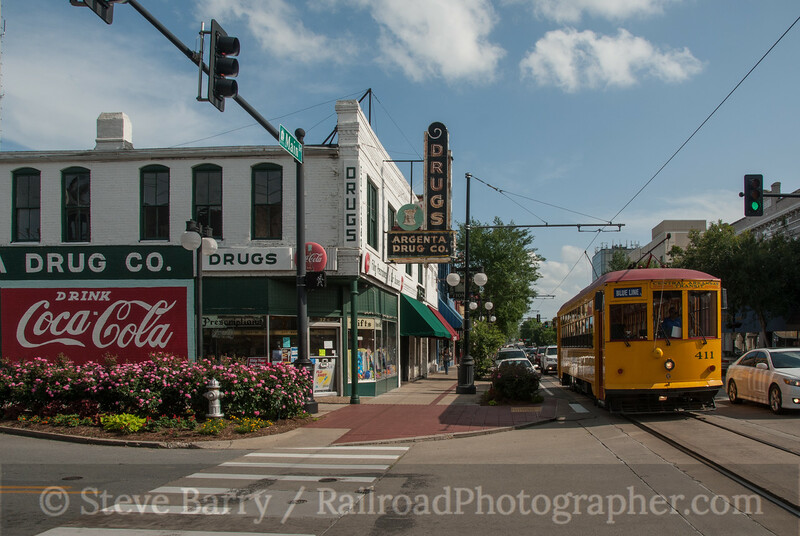 We are now in Little Rock, Ark., home to the decade-old River Rail Streetcar of Central Arkansas Transit. 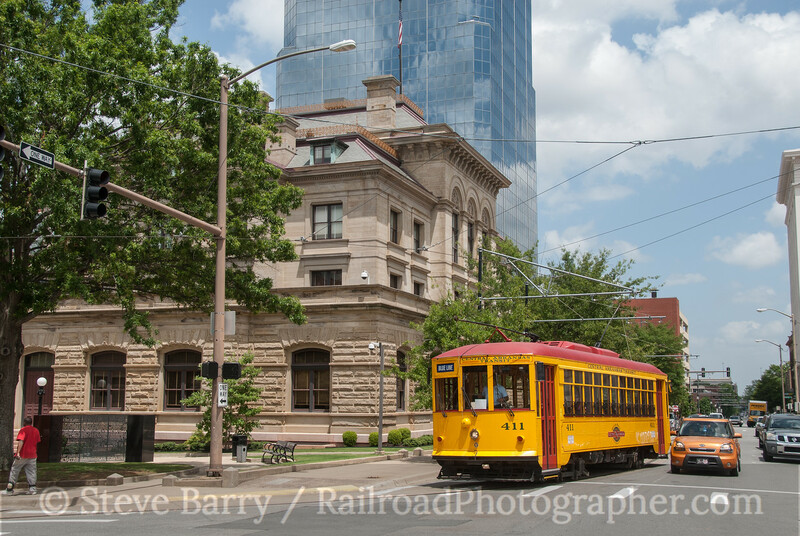 The River Rail Streetcar opened in November 2014 and operates 3.4 miles of track in Little Rock and North Little Rock. The original line operated 2.5 miles between the downtowns of the two cities. In 2006 an extension was opened to the William Jefferson Clinton Presidential Library. Three replica trolleys were used when the line initially opened and two more were added with the extension. 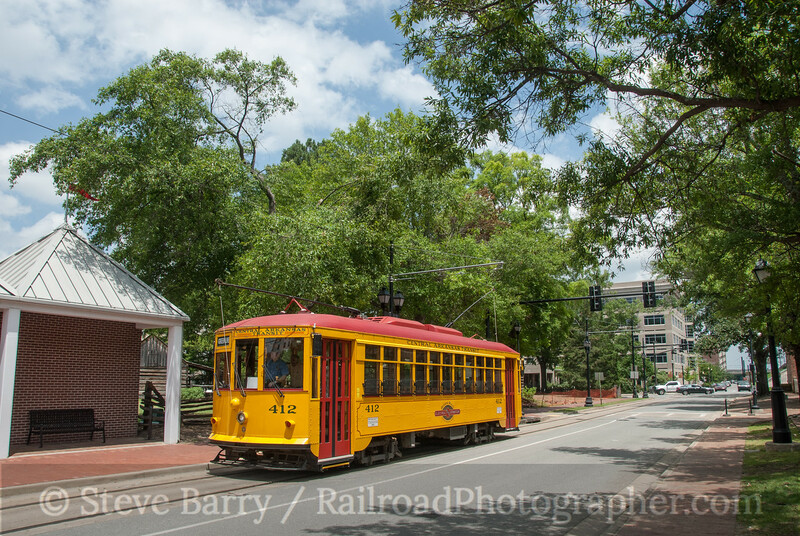 The cars, built by Gomaco Trolley Company, resemble the Birney cars that operated in Little Rock (which previously had electric streetcar service between 1891 and 1947); the original Birneys were numbered 400-407 and the five replicas continue that series, numbered 408-412. The line is broken down into two "routes," the Green Line and the Blue Line. The Green Line operates a loop through downtown, and continues on to the Clinton Library (except in the evening). The Blue Line covers the exact same loop downtown, but also crosses the Arkansas River to make a loop in North Little Rock; it also goes to the Clinton Library during the day. This two-route system means that North Little Rock only gets half the service that Little Rock gets. All the above photos were taken on the primary loop in downtown Little Rock. The photo below takes us out near the Clinton Library. All trackage is one-directional, running clockwise in Little Rock and counter-clockwise in North Little Rock. The Clinton Library extension is double-track with rail on both sides of the street. The exception to one-directional running is the bridge over the Arkansas River, where both northbound and southbound cars share a single track. North Little Rock has a picturesque downtown, and the system's car barn is located here. 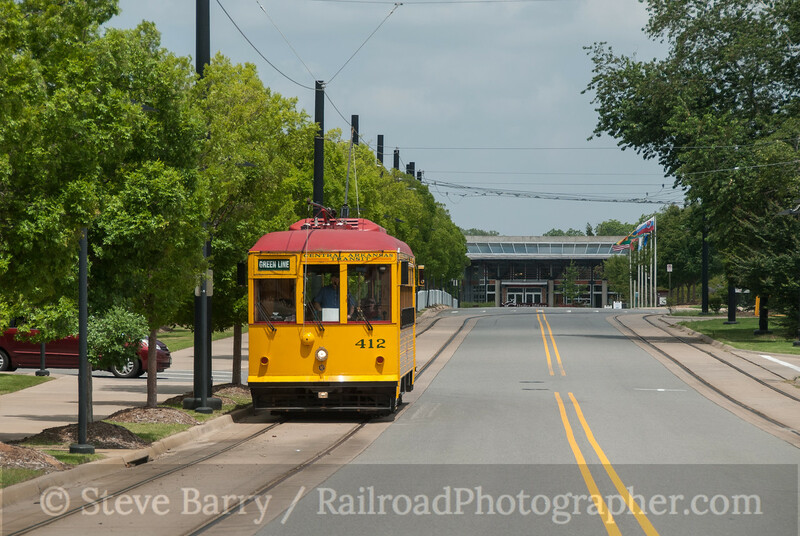 This concludes our look at the River Rail Streetcar, but while we're on the subject of Arkansas streetcars let's backtrack to the other operation in the state, the Fort Smith Trolley. 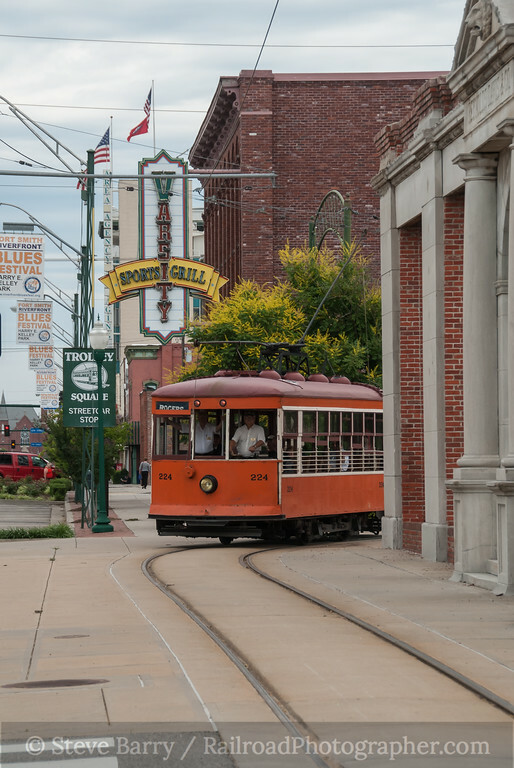 While River Rail serves as a means of transportation to tourists and residents, the Fort Smith Trolley is primarily a tourist ride. This is part of the Fort Smith Trolley Museum, and the trolley ride was inaugurated in 1991 on a quarter mile of track. Subsequent extensions now gives the line a distance of about 3,000 feet. The car in use in Fort Smith is an actual Birney car (unlike Little Rock's replicas), built in 1926. 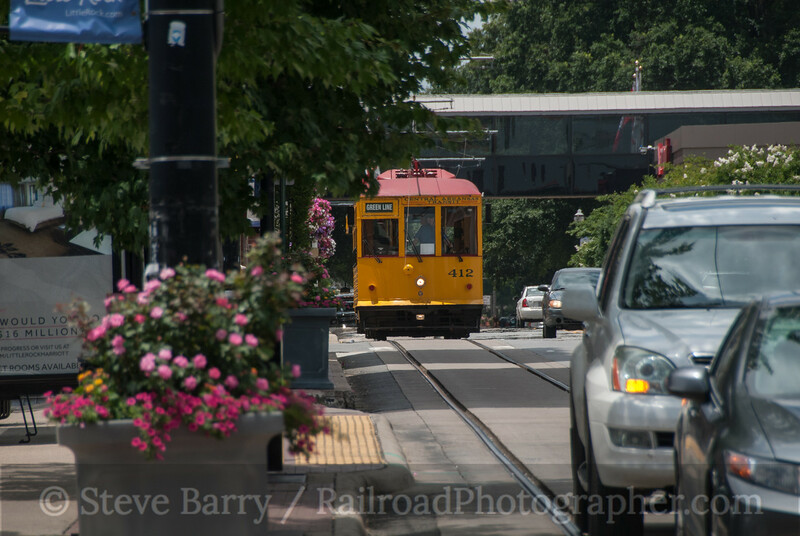 It served Fort Smith in regular service until streetcar service was discontinued in 1933. Several more streetcars (including a couple of Little Rock Birneys that are being combined into one operable car) are undergoing restoration. Much of the collection is native to Fort Smith. 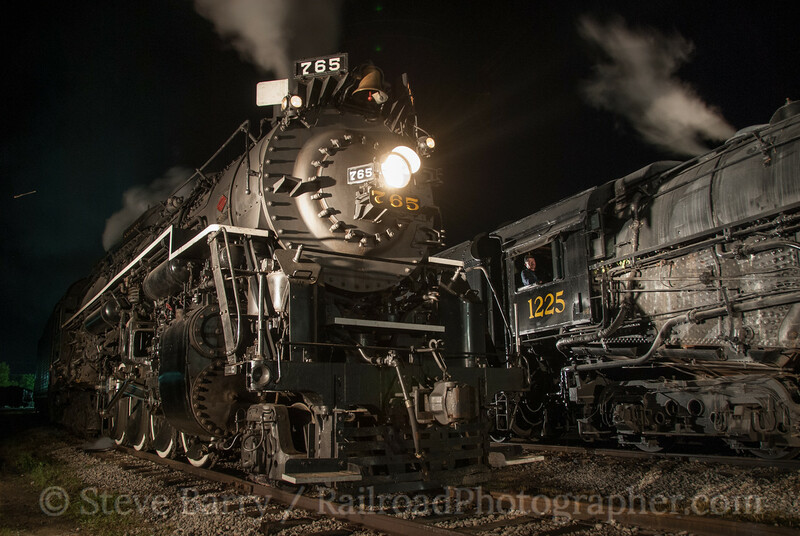 The museum also owns three locomotives of various types, the most notable being Frisco 2-8-2 No. 4003. 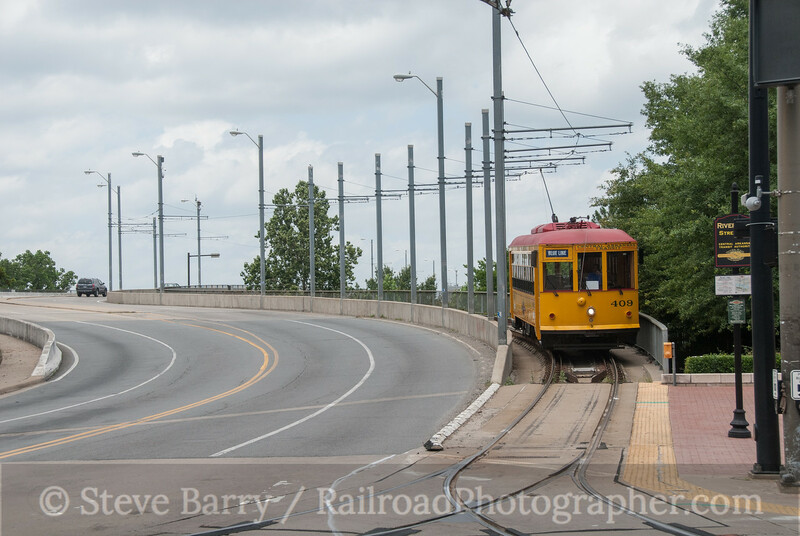 More photos of the River Rail Streetcar in Little Rock can be found here. 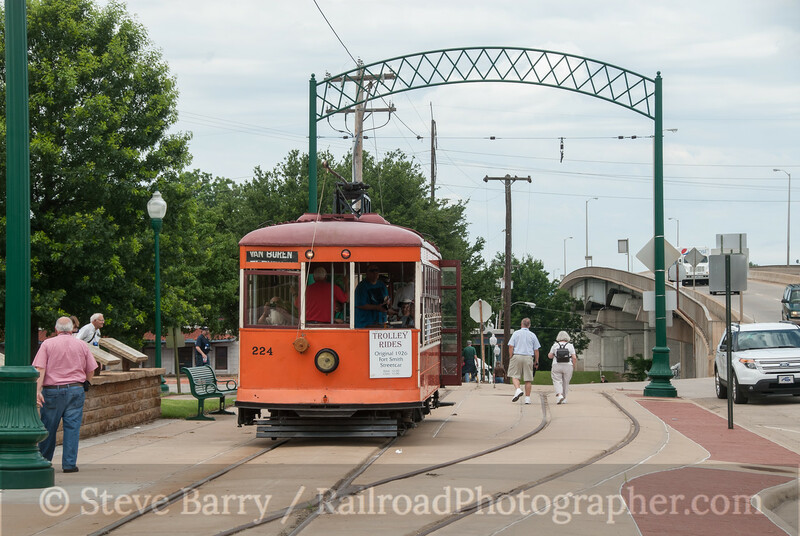 More photos of the Fort Smith Trolley (and the NRHS convention train that went there on the Arkansas & Missouri) can be found here.